If you decide that you no longer want your site to be live on the internet, you can easily unpublish it. Your site will then no longer be accessible to the public. 1. 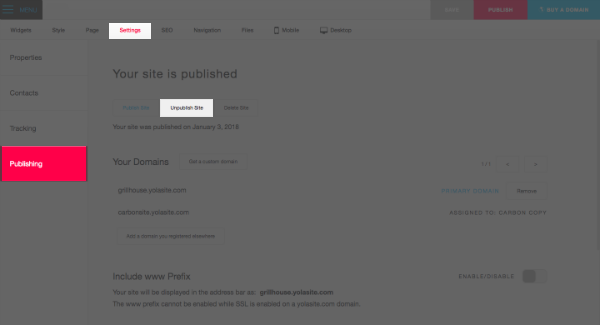 In your Sitebuilder, go to Settings > Publishing. 3. A confirmation dialog box will open. 4. 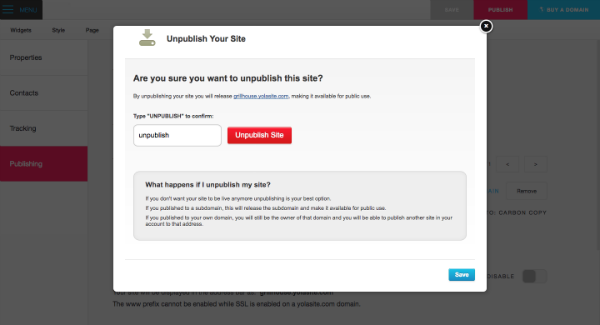 Type "Unpublish" into the text box provided and click Unpublish site. 5. Your site is now unpublished. Please note: If you had your site published to a subdomain and you unpublish it, your subdomain becomes available to be used by other people. If you published your site to a domain purchased through Yola, or a domain you purchased elsewhere, you will keep your domain. Locate the correct site name. Click Domain settings, located below your site's name. Next to "Add an existing domain" select the domain you wish to assign to your site and click Add. Choose which site you would like the domain assigned to.